Lechon sa Oven Inasal Style. I was looking for an alternative stuffing of my next Lechon sa Oven. I thought this time I use a stuffing similar to Chicken Inasal. Now let me share my latest innovative Lechon sa Oven Inasal Style. 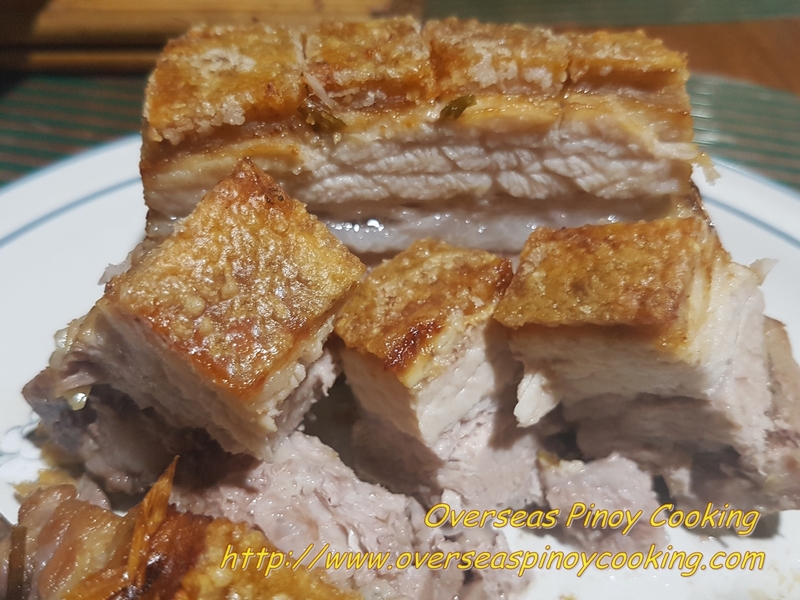 The last time I cooked my Lechon sa Oven I had difficulty in chopping the roast pork skins into squares, because it was so crispy the skins break easily with just minimal pressure. What I did with my Lechon sa Oven Inasal Style was to cut the skin into squares. 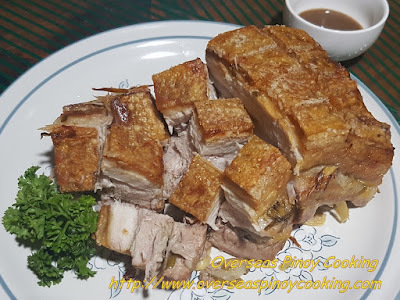 The slits will served as a guide for evenly cutting the lechon once served. I also pre-boiled the pork prior to oven roasting. For really crispy skin, using a fork I pricked the pork skin all the way down to the meat layer, similar to my Lechon Macao. For the stuffing of my Lechon sa Oven Inasal Style used chopped some lemon grass, chives, onions, spring onions, garlic and some ginger and vinegar, exept for the vinegar it is basically similar to my Balamban Liempo. If you are also looking on otheroven roasting your pork, click the linc list below to check the post on the archives. 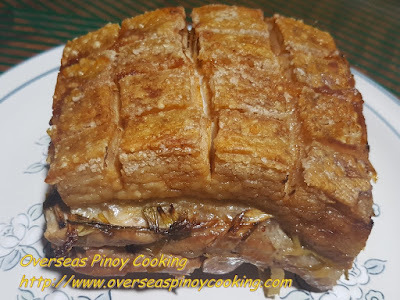 Here is the recipe of my Lechon sa Oven Inasal Style, try it. 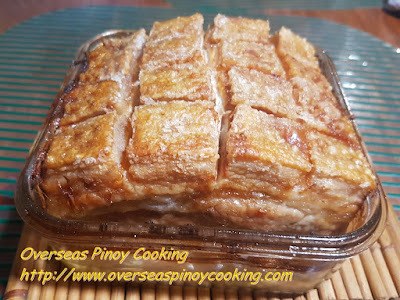 In a large sauce pan place the pork belly and add water to cover the meat up to about 2”. Add the crushed lemongrass, quartered onion, crushed ginger, whole garlic and some salt. Bring to a boil and simmer for 30 to 45 minutes or until just tender. Remove from pot drain and let cool down. Using a fork prick the pork skin all the way down to the meat layer. The skin should be pricked as close as possible. Using a sharp knife slit cut the skin into squares all the way down to the meat layer. Cut similar slit at the back of the pork belly, making sure that the slits are aligned to the slits of the skin. 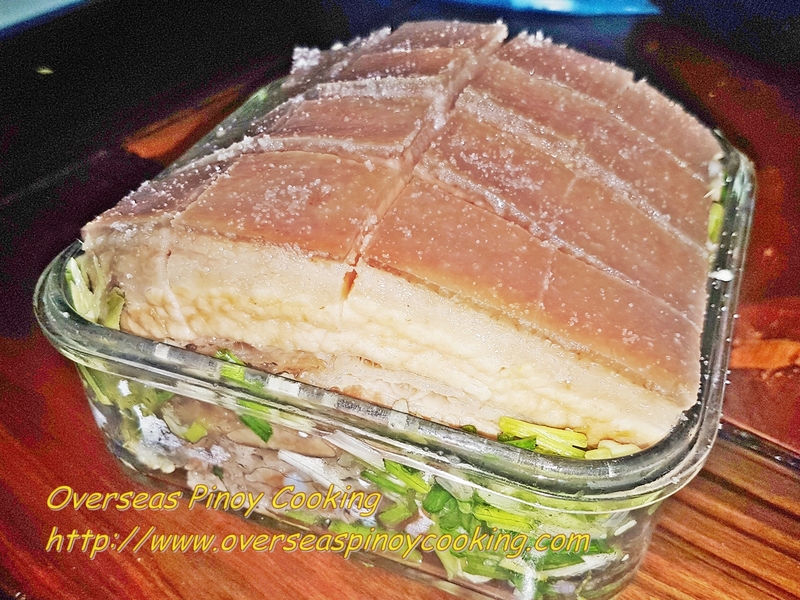 Pat dry the pork belly and generously rub all sides with the margarine then with salt and pepper, keep aside. Let marinate with the salt and pepper rub for 30 to 45 minutes. In a roasting pan with the same size with the pork belly, place and arrange to form a bed of the stuffing made up of chopped spring onion, chives, lemongrass, onion, ginger and garlic, keep aside. Place the seasoned pork belly in the roasting pan with the skin outside. Drizzle the pork belly skin with the vinegar. Pre heat the oven at 250°C when the oven is hot place the baking tray at the center. Roast for 1 to 1 1/2 hours. Check periodically if is the skin changes color suddenly, reduce the oven temperature to 200°C. Let it roast till the pork skin is blistered and turned to golden brown. 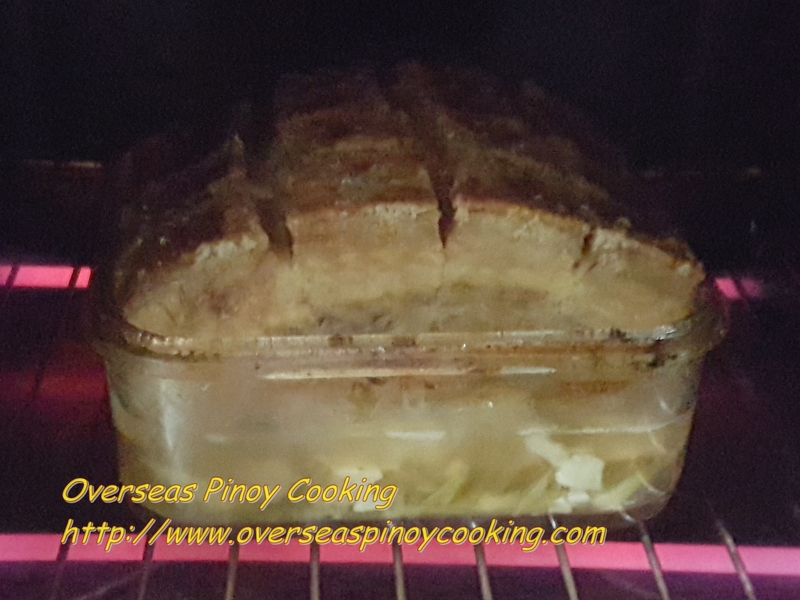 Remove from oven and let rest the meat for at least 10 to 15 minutes. When ready to serve chop in into squares using the pre-cut slits as guide. Serve with your favourite dipping sauce.